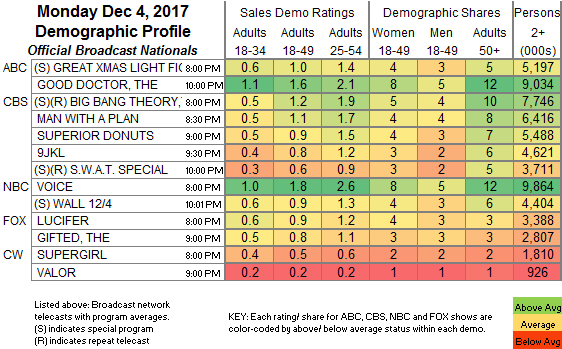 NETWORK FINALS: After adjustment for football preemption, THE GREAT XMAS LIGHT FIGHT, THE GOOD DOCTOR, THE VOICE and THE WALL all dropped 0.1. CABLE HIGHLIGHTS: ESPN’s MONDAY NIGHT FOOTBALL had a good week, up 0.80 from last week’s game to 3.49. On USA, the WWE telecast was at 0.96/0.87/0.78, compared to last week’s 0.94/0.89/0.89. On VH1, LOVE & HIP-HOP slipped 0.03 to 0.94, and SCARED FAMOUS was up 0.04 to 0.60. Discovery’s STREET OUTLAWS dropped 0.09 to 0.68 after a 0.41 lead-in special, and it was followed by the premiere of CASH CAB at 0.33/0.25. On MTV, TEEN MOM dipped 0.02 to 0.67, and FLORIBAMA SHORE was at 0.43, compared to last week’s 0.46/0.44, with an extra lead-out hour of TEEN MOM at 0.37. On Bravo, the season premiere of VANDERPUMP RULES was at 0.59, compared to 0.34 for last week’s special, and its lead-out was the premiere of RELATIONSHEP AT 0.26. On Food Network, HOLIDAY BAKING CHAMPIONSHIP dropped 0.04 to 0.44, and CHRISTMAS COOKIE CHALLENGE was down 0.08 to 0.30. On cable news, MSNBC’s RACHEL MADDOW SHOW had the lead at 0.35/0.53/2.9M, over Fox News’s HANNITY at 0.31/0.55/3.3M and CNN’s ANDERSON COOPER 360 at 0.27/0.37/1.2M. On ID, PEOPLE MAGAZINE INVESTIGATES fell a tenth to 0.26, and DEADLIEST DECADE was down 0.06 to 0.22. 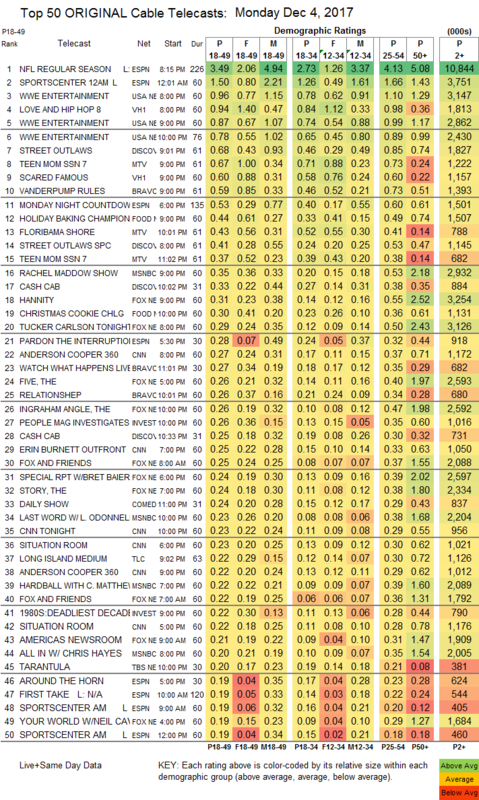 On TLC, LONG ISLAND MEDIUM lost 0.02 to 0.22, THE HEALER rose 0.02 to 0.18, and LONG LOST FAMILY was down 0.03 to 0.16. TBS’s TARANTULA premiered at 0.20/0.13. On HGTV, HOUSE HUNTERS declined 0.03 to 0.19, and HOUSE HUNTERS INTL was down 0.05 to 0.18. On AMC, RIDE WITH NORMAN REEDUS dropped 0.04 to 0.13, and SECRET HISTORY OF COMICS was down 0.06 to 0.08.